Do you know where copper wire comes from? From mommies pinching pennies! Forgive me, but I still find that joke funny, no matter how many times I hear (or tell) it. As a stay-at-home mommy, I have been a little bit consumed with saving money, so I can continue to stay at home with Boo Bear. We all know that breakfast is an essential part of a healthy diet, (if you didn’t know this before, Breakfast is good for you! So eat it. Everyday!) For us, breakfast normally is a bowl of brand-name cereal (Life Cereal is my fav) and a cup of coffee with milk and sugar. (What do you put in your coffee?) Now the coffee is a non-negotiable, as I explained to Mr. Man when the subject of cutting coffee to save money was brought up. I am a very growly bear before I have my coffee. You do not want a growly bear for a wife. So what can we do to trim the budget a bit? Where we live, the gigantic box of Cheerio’s or Life usually run between 6 and 8 dollars, depending on how good of a sale I can snag. But, with two grazing adults in our home, we can run through the gigantic box in about 10 days. No word of a lie. Instead of buying cereal which is ridiculous expensive, at about 50 cents a bowl (Yes I calculated it. I know I’m a nerd. Thanks) I spend about 15 minutes making muffins or something and spend around $1.50 for about a week of breakfasts. Ta Da. Money saved. To the tune of $30 a month. If you’re not worried about being healthy, then you can totally make yummy chocolate chip (or double chocolate!) muffins or other naughty breakfast things. Because you’re saving money! And with the money you save on food, you can totally afford to go to the gym. 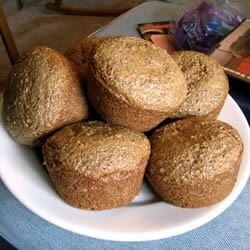 So, I decided to go the healthy route and make bran muffins. I used this one from Allrecipes. But instead of buying buttermilk, I threw 1 tbsp of lemon juice into a one-cup measuring cup and filled it up with milk and let it sit for 10 minutes with the bran. Done and done. I made mine in mini muffin form so I can have as many as I am hungry for instead of eating a whole muffin when I only needed half. A little bonus of having mini muffins kicking around is that Mr. Man ends up munching on these while he’s playing video games instead of cookies. Double win. What ways have you found to save money this week?